Summary: Sarkar completes Varma’s trilogy of gangster flicks and once again he excels in documenting the human side of the underworld. Sarkar, meaning Government, Higher Power or more aptly in this case – Supreme Authority tells the story of powerlord / gangster Subhash Nagre, played by living icon Amitabh Bachchan. As the opening credits clearly state, this is “inspired” (read adapted) from The Godfather. Most likely a travesty on multiple accounts, but Verma pulls this off on many levels. Self-righteous Sarkar’s motto is “There are no rights or wrongs… simply power” and with a constant menacing grimace about him, you quite simply wouldn’t want to f*** with him. We aren’t really given much background on him, why he is the way he is, what made him “Sarkar” and how he justifies what he does. He simply advocates his own brand of justice for the masses. For someone with such authority, respect, stealth, and such a feared reputation, his empire soon begins to unravel at an alarming rate after his refusal (as in the original) to dabble in “that business”. Soon enough Sarkar is fighting not just for ‘his people’, but his family, as battle lines are drawn and the differences between friend, family and foe become even more difficult to distinguish. Ram Gopal Varma has done a commendable job (some would say foolish) in adapting The Godfather, as it luckily isn’t a cheap copy, rather an extremely powerful re-telling of the saga. To adapt something of this stature takes a great mind [Verma truly a Mahatma of sorts] as he has succeeded in producing a very contemporary urbane Indian take on the classic. He focuses on the relationships, and the impact that pressures from all vicinities have on them. The battle between good and evil, personal demons, morality, greed, lust… and the thirst for ultimate power. This is simply phenomenal cinema, with a taut narrative it moves at a sure pace and is far from predictable as writer Manish Gupta has managed to implement enough new twists and surprises to keep us guessing, and on the edge of our seats. Cinematography by Amit Roy is exemplary, and the music score [Amar Mohile] is quite powerful, if a little jarring / premature at times. Verma has created an extremely tense tone for the film, and this has been adeptly enhanced / kept consistent by the afore-mentioned faculties. Amitabh Bachchan and son Abhishek are cast together as father and son for the first time, and in this film – junior has truly arrived. Amitabh bases his character on real-life right-wing political supremo Bal Thackeray; a man who seemingly rules Bombay, and decreed its name change to ‘Mumbai’. 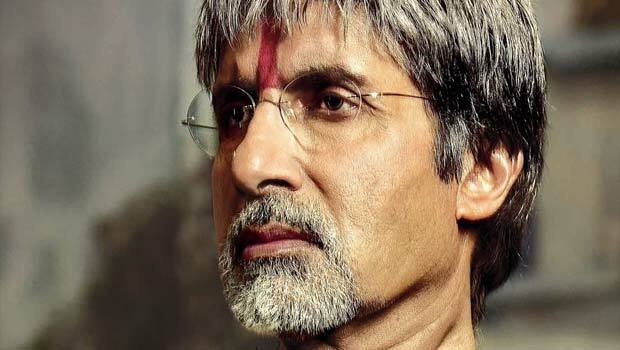 Amitabh plays Sarkar as strong, worldly and resilient, with a natural air of authority about him. Whilst Abhishek simply broods in the first half, he delivers a seasoned and compelling performance in the second, with a phenomenal screen presence which more than matches his legendary father. Kay Kay is simply blinding as the quick-tempered power hungry sibling [those searing eyes] and leaves an impact. Sarkar completes Varma’s trilogy of gangster flicks [after Satya and Company] and once again he excels in documenting the human side of the underworld, as people with families, feelings and issues. This is a gritty, powerful and dark film, with stellar performances (no songs) and a compelling narrative. I’d liken this more to an ‘Infernal Affairs’ than a Bollywood film / audience. An extremely powerful piece of film, quite simply – watch it.